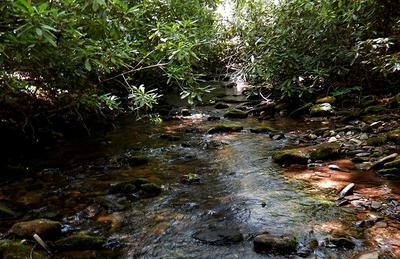 This week I fished another North GA creek for small wild trout. 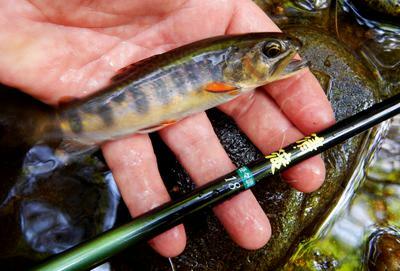 I used a Kiyotaki 18 rod, 7-ft of Yamatoyo 3.5 fluorocarbon level line, 2-ft of 5X tippet, and a size 14 JuteBug. At the lower elevations small rainbows were plentiful, after getting above two waterfall barriers brookies took over and were lots of fun on the Kiyotaki 18. In the past I’ve had a hard time seeing “orange” hi-vis level line in shadowy areas and wanted to try a different color, the Yamatoyo level line is “chartreuse” it really stood out against the dark shadows of the rhododendron. It also has less memory than the Sunline 3.5 fluorocarbon level line that I have been using. It doesn't get much better than that. 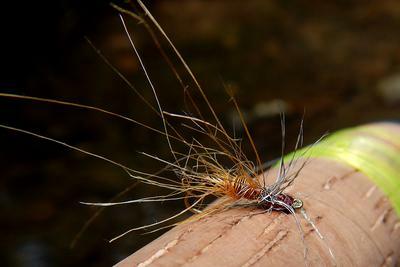 I have been tying the same jute bug fly with success. I mix the jute with some Rams wool-brown and reddish in color with soft hackle. After spending ton of $ on fly tying materials, I have settled on $10 worth of materials. Well done, excellent post. Glad you're back on your feet. Thought I recognized this from FB. I'll be up in N GA with my Kiyotaki 24 next week. That Jutebug looks awesome. Andy- glad to heard someone else ties using jute. I tie a variety of flies using Jute, some with wool, some weighted, some not and some with feathers. Like you I like the low expense of the material and getting some crazy looking flies. 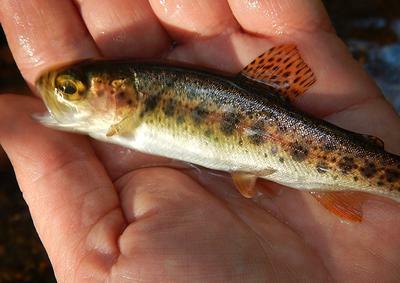 I've caught rainbows, browns and brooks all on the same fly pattern...if you can call it a pattern. I've dyed Jute using black tea, Rit-dye and Kool-aid, not all at the same time. I've settled on natural, ginger and a mossy green and I buy black from the craft store. I haven't taken many fly photos lately but I'll dig some up and post. Hope you will do the same.